Handmade in America, this sofa features welted track arms and tufted back cushions covered in gray upholstery, plus three accent pillows. 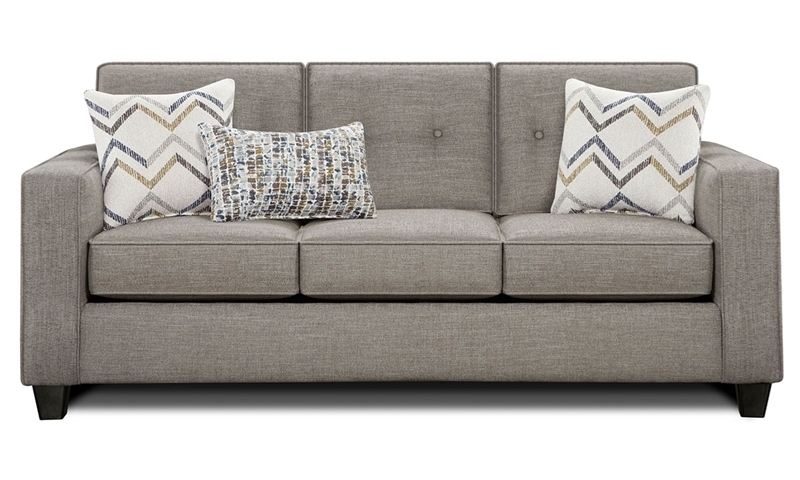 Meticulously tailored in versatile gray upholstery, the Sensation sofa will make the perfect addition to your living room. This American-made sofa features a handcrafted hardwood frame and sinuous steel seat springs for lasting support. Thick track arms and tapered dark wood feet create a simple silhouette, further accentuated by self-welted box cushions and hand-tufted details. Three included accent pillows showcase patterned fabric on one side, lending a pleasing pop of color to this family room-ready gray sofa. 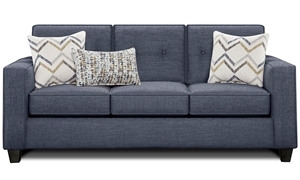 Handmade in America, this sofa features welted track arms and tufted back cushions covered in navy upholstery, plus three accent pillows.